We are now officially ready for Christmas. No, all the presents have not been wrapped. Christmas dinner still has to be cooked. Some Christmas cards still need to be mailed. But the important item on the list has been accomplished. 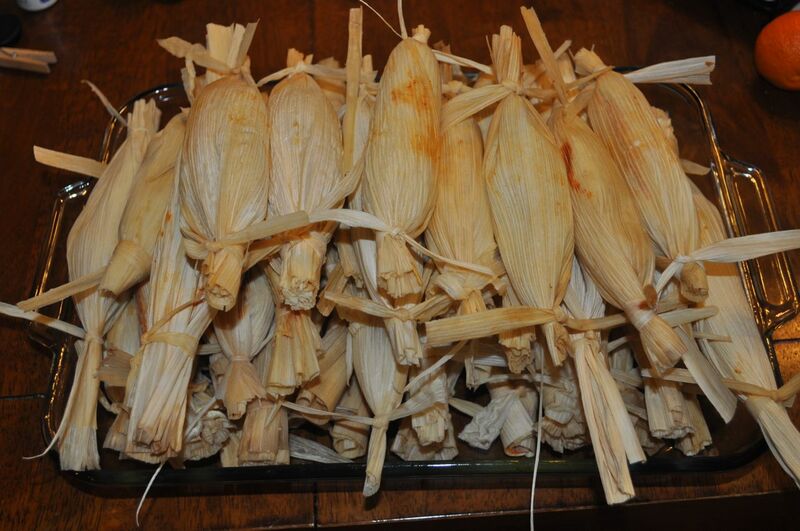 The tamales for Christmas Eve have been assembled. And I think tonight will be the annual watching of It’s a Wonderful Life. Then, maybe, we’ll get to wrapping the presents. This entry was posted in Christmas, Cooking, Family. Bookmark the permalink. Uhg! I feel like I’m missing out on life not doing this. Tamales are one of my favorites. I’m going to have to get on it at some point! It was a little overwhelming at first, but It’s gotten much easier with practice. We’ve yet to perfect it, but the process and end result are both enjoyable. Yummy, we are getting ours from a restaurant. Kitchen will be finished today, so we can cook Christmas dinner. We tried the restaurant thing here when we first moved. The idea of 2 dozen tamales was foreign to them and the price was outrageous. So, it’s become a fun tradition. Glad the kitchen will be finished. Nothing like cutting it close!